Despite Sandy’s misgivings about our ability to get out of bed in time, we got up this morning with a minimum of fuss. On travel days, I always find it easy to get myself going anyway. It sometimes helps to have a specific purpose or goal to aim for – or perhaps more accurately, a deadline to meet. We were swiftly packed and left our room and door keys on the reception desk on the way out, as agreed with the proprietor yesterday. Loaded down with full travel regalia, we marched off down the street to the MTR entrance just a few feet from our building. Once again, the efficient MTR network delivered us quickly and comfortably to the end of the line where we would meet our ferry. The woman at the front desk last night told us to head for exit B at the MTR terminus but this turned out to be inaccurate. Perhaps it was her accent or maybe she simply said B when she meant to say D but either way, we found the ferry terminal OK. I think the travel jitters were getting to Sandy this morning. Everywhere we went, she seemed to be in either a rush or a fluster and was constantly worried about the time. We do still get this way sometimes, even if we are getting better at this whole travelling thing. The ferry this morning would take us from Hong Kong Island to Shenzhen in Mainland China. Although Hong Kong is technically a part of China, it still felt like we were going to a whole new country and that same feeling of anticipation we get whenever we are about to add a new country to our growing list was ever present. The customs and immigration checks we had to pass through, only served to reinforce this idea of moving from one country to another. There were quite a lot of steps and escalators involved in getting from the MTR platform all the way to the ferry embarkation platform. In a way, we were very lucky to be wearing our luggage on our backs. The other passengers with wheeled luggage didn’t fair quite so well. Our ferry, although quite modern and streamlined looking, was quite small and looked very unstable as it rocked side to side in the water. When we both saw it, we were immediately quite glad to have taken a couple of Cinnarizine tablets before we left the hotel. The sick bags in the seat pockets in front of us were a give-away that the crossing might pose a problem for travellers that suffer from motion sickness. As it turned out, the ride was quite comfortable. The ferry moves very quickly over the water and this speed evidently gives it quite a bit of stability. At speed, there was hardly any swaying at all. There was only one deck and we were completely enclosed from the outside world. It was largely empty but clean and well-staffed. The ride took just over an hour all told. When we stepped onto Chinese soil for the first time, it was almost an anti-climax. It looked no different to any other ferry terminal anywhere else in the world - quite characterless, really. Some more immigration formalities and we were outside again. There were the usual array of taxi drivers waiting to greet passengers but, notably different from India, nobody was screaming at us or trying to entice us into their cab. They simply stood there, some leaning on their cars, waiting for someone to approach them for a ride into town. We weren’t going into town, as we had a flight to catch and the free airport shuttle bus was already waiting there to greet us. Collecting our backpacks from the ferry made us amongst the last passengers to clear the terminal and the shuttle left shortly after we boarded. The airport terminal building was just a stone’s through from the ferry terminal and the ride over took just a couple of minutes to complete. Other than the fact that the advertising boards depicted produces and services with Chinese writing only, there really wasn’t much we could say about China so far that would make it sound Chinese. We could have been in almost any other transportation hub anywhere else in the world at this point. The airport is much smaller than Hong Kong’s Chek Lap but looks every bit as modern and new. Lots of wide open spaces everywhere and all the usual trappings of an airport terminal building. We checked in without any problems and decided to take advantage of the one ATM in the terminal building to try to obtain some local currency. This is where our first barrier needed to be surmounted. The ATM did not display any English translations. It made me feel like a prehistoric ape trying to understand how to work a jet engine. There was a uniformed woman nearby who didn’t speak any English but did seem to grasp the fact that I needed assistance understanding what buttons to press. We went through the motions that you might expect at an ATM but we seemed to keep reaching an impasse and I just couldn’t decipher the hand gestures she was making to try to explain what was happening. I had failed to make an ATM withdrawal the other day because I’d reached my weekly limit on the card so I had Sandy try to use her card thinking that this was the problem. Unfortunately, she met with the same problem, whatever it was. The woman then directed us to another counter and I thought she was suggesting that there might be someone there that spoke English. Then, quite disgustingly, she coughed up a huge gob of spit and directed it into a nearby bin as we were walking away. Apparently, this is quite normal and common in China and is a just a part of their normal daily lives. It’s quite sickening and will take some getting used to. None of the people sitting at the counter we were directed to seemed to speak any English but someone did seem to understand the meaning of the words ‘money change’ and pointed us in the direction of the next terminal building. We set off in search of hoping to find Bureau de Change office somewhere. What we found instead looked more like a bank. There was another ATM there and this one did have English translations on the screen but it too would not give us any money. The reason it gave was that our cards had expired – something we know not to be true. Everything was posted in Chinese with no English translations anywhere but the electronic board full of numbers very much resembled a currency conversion chart so we joined the queue just in case. I prepared some US Dollar traveller’s checks and some cash also. I flashed the TCs in front of the clerk when it was our turn but his body language didn’t look promising. He smiled when I flashed the cash so I handed over two one hundred Dollar bills and he dispensed ¥1,620. This was a more favourable exchange rate than back in Hong Kong and we now at least have some local currency to see us through the first few days. This will give us a chance to figure out what the problem is with our ATM cards. We think it’s just a case of needing to use the correct bank’s ATM. We had this same problem a few times in Africa. After receiving our money, there wasn’t much time before our flight started boarding but Sandy wanted to grab a bite to eat. What few restaurants and snack outlets there were looked like it would take us too long to climb the communications barrier so we decided that the one MacDonald’s would be the easiest option. A very short and young looking staff worker there was the only person that knew a few basic words of English and she very helpfully assisted us with our order. It was quite cheap at just ¥26 ($3,20) for both our breakfast meals and drinks. We shovelled it down whilst making our way back to our own terminal building and passed through the security checks without incident. Our plane had started to board already but, of course, our gate was at the far end of the concourse. Still, we made in onto the shiny new plane in time and are now cruising above the clouds on our way to Beijing. Back down to earth again, now, and sitting comfortably in our hostel room somewhere in the middle of Beijing. Coming into Beijing, we flew through what seemed like a thick, white fog. It was so hazy, in fact, that I thought we were still at altitude when we suddenly touched down. Beijing’s International is a modern airport just as is Hong Kong’s and Shenzhen’s. The only real difference is that almost nobody here seems to speak English. I say almost, as an airport worker approached me whilst I was sitting on a trolley waiting for our baggage carousel to start moving. He seemed interested in the China guidebook that I was reading. We exchanged pleasantries and I took the opportunity to ask him to write down the name of our chosen hostel along with the address and directions in Chinese so I had something to show the taxi driver, whom I fully expected to speak no English at all. He obliged willingly but also had difficulty understanding the English and phonetic spelling used by the guidebook. Had we chosen a hostel from our other guidebook, it wouldn’t have been a problem since everything is written in English, phonetics and Chinese script also. I wasn’t certain that what the nice man had written was exactly what I needed but thanked him anyway and we went upstairs to find an information desk. We still needed to get a new SIM card for the mobile phone. Just exactly who we are going to call in China that speaks English is still very much up for debate but there’s a degree of comfort in knowing that you can at least make a phone call if need be. Perhaps I can call the teacher that we plan to meet in Xi’an to let her know that we’ve arrived in China. The rather helpful woman behind the information desk was deficient in just one small detail. She didn’t speak any English. In fact, none of the staff at the information desk spoke English. After several attempts at using body language, the situation deteriorated into everything I said being answered with a ‘no’ and a shake of the head. Getting a little frustrated with this, I even asked at one point “so, are you Chinese then?” to which she answered ‘no’ and shook her head. It seems that the default position of the Chinese people is to answer negatively if they cannot understand you. This is a bizarre turn or events for me. I’ve never been anywhere where I couldn’t at least communicate even just a little in English but here it’s a different matter. It’s actually quite alienating and disconcerting at the same time. For a control freak such as myself, it’s very disarming to not be able to take control of a conversation, not to mention very frustrating at not being understood. Luckily, a passer-by saw the scene I was creating with my ever-wilder and more frantic hand and arm gestures and must have taken pity on me, as she asked in English if she could help. I accepted eagerly and told her I wanted a translation of our hotel name and address into Chinese. She took a stab at this herself but based on her apparent incomprehension of the guidebook phonetics just like the guy downstairs, I was still in doubt about the accuracy of what she wrote. She did manage to find out from the information desk that it would not be possible to obtain a new SIM card anywhere in the airport (an oxymoron if ever there was one) so we thanked her and took our guidebook out to the taxi rank. There was just a small queue at the taxi rank and a stern looking, smartly uniformed, military officer was decisively pairing arriving taxis with passengers using what looked like a beating stick. Working steadily through the queue, he arrived at us and summonsed a taxi forward. Our taxi driver, of course, spoke no English so we took out our guide and showed him the translated writing we’d accumulated as well as a city map indicating the location of our hostel. He looked briefly at these and then hurled a lot of indecipherable noise in my direction. The Chinese have a tendency to speak very confidently and brashly and often times with a great degree enthusiasm, not to mention volume. It can quite easily be incorrectly interpreted as an angry shout or argument when this is really not the case. Our huge and overpowering taxi driver continued to repeatedly throw loud noises in my direction but all I could do was look alternatively at him and the uniformed military guard with a blissfully arrogant ‘I’m so very stupid’ kind of look written unintentionally all over my face. The two of them exchanged a couple of brief words and we were swiftly ushered into the cab with the business end of the nice man’s beating stick. Where the cab was heading for was anybody’s guess at this point. I was convinced they had decided between them to simply drop these idiot tourists off at some place in the middle of Beijing and be done with it. We passed through a tollgate on the decent, four-lane, highway and about ten minutes into the journey, I finally found the page in the guidebook where the Chinese characters for the various hotel names and locations were printed. I circled ours and handed the book to the driver. He nodded back at me and grunted some more weird sounds, which I interpreted to mean he understood. For all I knew, however, he might have been telling me what a gibbering idiot I was and that I should piss off back to where I came from you great fat, ugly, baboon. There was no way to tell. 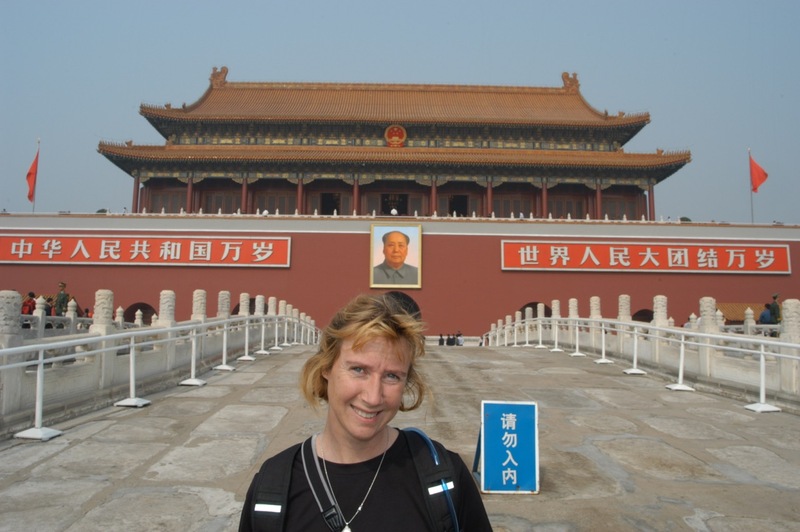 We eventually made it off the broad highway and found our way deep into Beijing. Everything is a lot more open than I had expected with very wide streets lined with medium and large sized buildings. Quite a few people were about with many walking whilst others cycled. The interaction between the cars and busses on the one hand, and the pedestrians and the cyclists on the other, was more orderly than Cairo or India but still very haphazard and loose. Sticking to lanes and observing traffic signals seems very much to be optional here. The same, white, hazy fog that we saw at the airport was present all the way into Beijing. I can only assume that it is some sort of thick air-pollution but it’s the whitest and most opaque pollution I’ve ever seen. By some stroke of miraculous good luck, we did eventually find the hostel we were looking for. It seems I won’t have to piss off home after all. It probably means I was never an ugly baboon either but we’ll split the difference on fat. Our first impressions of the hostel were quite encouraging. There were backpackers wandering about the place and the guy at the front desk spoke passable English. He showed me a triple room, which was the only suitable room he had for us but told us that we could move into a double tomorrow when someone else checked out. After a simple and brief negotiation, the room rate for today came to ¥200 ($24,50). We didn’t haggle over the price of tomorrow’s room. They like to receive their money up front and I handed over two one hundred Yuan bills along with a third for the key deposit. Our room is very spacious and does have an on-suite bathroom with a sit down toilet and a shower. No towels and no breakfast included, however. After checking in and ditching our bags, I spent a half hour chatting with a young woman who called herself Victoria. She did tell me her Chinese name but I couldn’t recognise any consonants in the sound she made when she spoke it and I’d have no idea how to represent this sound using any of the keys on my keyboard anyway. Victoria gave me lots of information about the hostel, Beijing and the various tours that they sell. She told me where I could buy a mobile phone SIM card and even wrote down a couple of lines of Chinese script for me to hand over to the attendant in the shop. After finishing our little chat, I took her little note and wandered off into Beijing to find the shop. I followed her direction to the letter and found a row of shops that I was sure was the right place but could not find any particular shop that looked like it might sell something like a SIM card. There were couple of ladies playing badminton in the street and I passed them no less than four times as I walked up and down. Eventually, one of these sportswomen motioned using a phone in my direction and we immediately clicked. It was her little convenience shop that sold the SIM cards and we went inside. Confidently, I pulled out my little piece of paper with the pre-written instructions on it and handed it to her. She looked at it, turned up the right way and then made a lot of sound in my direction. Immediately, I was stumped. I had not anticipated being asked any questions and my ‘I’m so very stupid’ look draped over my face again. Using hand gestures and other body language, we spent the next fifteen minutes essentially learning a new form of communication. In this new language we managed to convey enough meaning to each other to get the general gist of what I needed. I ultimately paid her ¥80 ($10) for a new SIM card, which she kindly installed and activated for me, and a further ¥50 ($6) for some other card which she unwrapped for me and keyed a load of numbers into my phone from. I’m not exactly sure what this other card was. It was either a top up of additional minutes onto the new SIM card or, as I’m hoping to be the case, it was something that expanded the usage of the SIM card to beyond the area in and around Beijing. I had tried to tell he that we would need to use the phone all over China and not just here. I’ll figure it out eventually – probably on our last day in China. Flushed with the success of my recent communicative triumph, I went back to the hotel to collect Sandy and we went out to get a bite to eat. Victoria armed us with a business card that says ‘please take me back to the Saga Youth Hostel’ in Chinese along with a nice little map pinpointing its location. The idea is that we would hand this to a taxi driver if we got lost in the hope that we would at least some day make our way here to our luggage. There are a few decent looking restaurants just a hundred metres or so from our hostel but we weren’t quite ready to take on something as ambitious as a restaurant with no pictures of the food, no English on the menus and no English speaking waiters or waitresses. What do we depend on in these situations? You guessed it: America fast food franchises. And it just so happens that we have both a MacDonald’s and a KFC just ten minutes' walk from our location. Finger licking chicken for supper tonight! It’s busy but not so terribly crowded here in this part of Beijing. The pedestrians and cyclists by and large ignored us as we made our way to the big, red, KFC sign through the steadily thickening white mist in the diminishing daylight. The sun was now very low in the sky and looked just like a large, orange ball in the distance, through the sense white fog. Visibility was now down to probably less than one Kilometre. Every few yards or so, someone would cough up a huge glob of phlegm and release it with an Olympic launch in some random direction. I still find this disgusting and nearly gag every time. Each time I see this, I then spend a few minutes trying to force the revolting image out of my head by trying to think of random, innocuous, thoughts. Typically, when we order fast food, we never stick with any set menu. We always have to modify the order in some way, be it asking for a piece of breast chicken or asking for a burger without cheese or whatever. This has never been a problem anywhere else but as we stood at the KFC counter and looked at all the gibberish on the backlit menu board, it suddenly occurred to us that we might be in a spot of bother this time. To our great relief the young girl serving us did seem to know enough English to make the ordering process less of a nightmare. Indeed, we’ve found the staff at these fast food restaurants to be the most able speakers of English anywhere. This has held true for India, Hong Kong and now China too. Although it has to be said that this has not always been true in parts of America. We ate our fill and wandered around a bit inside the huge shopping mall where the KFC was located. It seemed like it was being rapidly drained of people, as if getting ready to close so we decided to check out the nearby HSBC bank to see if we would have any better luck with our ATM cards. The HSBC ATM had a notice on it stating that it was an international ATM that worked with foreign cards only and that local cards would not work. Encouraged by this, we gave it a try and were successful in withdrawing no less than ¥2,500 ($300). Together with the ¥1620 ($200) that we withdrew at the airport, this should see us comfortably through the next week or more. After that? Well, we’ll just have to cross that bridge when we come to it. Although this hostel seems perfectly OK, we think we might be able to do a bit better and may use the opportunity during tomorrow’s excursions into the city to call around some other places to see what can be arranged. What is particularly worrisome is that all the great wall tours that they offer here are in groups of up to fifteen people or more and include mandatory stops at places where ‘you can do some shopping’. This doesn’t sound particularly appealing to either of us and we will definitely want to explore some more options. Tomorrow, as they say, is another day.